***THIS VEHICLE IS LOCATED IN LOXLEY, AL. Loxley, Alabama is 25 min east of Mobile, AL and 30 min west of Pensacola, FL ***3425 S Hickory St (aka HWY 59) is the address. That is just 2 miles south from Exit 44 off Interstate 10 and is across the street from the Burris Farm Market. See you there! You can call us at (251) 964-1300 or if you prefer texting (251) 490-2306. This is the 2012 Honda Civic. The Honda Civic been a bestseller for decades with millions being sold in the U.S. since its 1973 introduction. The Honda Civic has become a household name and an extremely popular car, known for its reliability and versatility. The condition of this Civic is great both inside and out. The Carfax report shows it has only had 2 owners. Carfax also shows it was in an accident back in June 2017 and there isn’t any details about what happened. Today the car looks like nothing ever happened. Carfax even offers a Buyback Guarantee. That guarantee states that this car has never had severe damage, odometer issues or lemon history. If you find out any of that is not true, Carfax will buy the car back from you. We can tell you the title is clean and clear. This Honda Civic comes with the ECON system button. If you don’t know what that means, here is an explanation. Honda ECON Button works by changing how your throttle response, cruise control, air condition and transmission works. The throttle response is affected in the middle range. The beginning and end range of the throttle response is not effected. Therefore the difference will be felt at highway speeds. The gas pedal will feel a little softer reducing acceleration but gaining better gas milage. While in cruise control with the ECON button on the transmission wont shift down as quickly. Therefore while driving up a hill in cruise control the vehicle may decrease in speed until the vehicle reaches the crest of thill in order to save gas. The ECON button also effects the air conditioner by turning the compressor on and of more frequently which will save fuel. The down fall is that the vehicle will take much longer too cool down on a hot humid day. Last but not least the transmission changes the shift points in order to be more fuel efficient while in ECON Mode. This Honda is great on gas and you will love that! Our Honda Civic looks great as you can see in the photos and in person. If you need a reliable car with a bit of a sporty look and is great on gas…then hurry on in today and check out this 2012 Honda Civic. You just can’t go wrong with a Honda Civic! 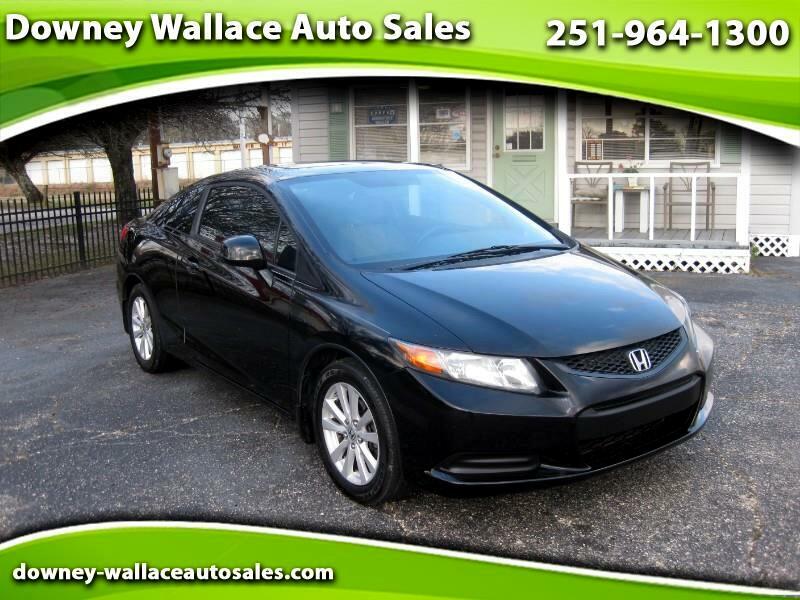 Visit Downey Wallace Auto Sales online at downey-wallaceautosales.com to see more pictures of this vehicle or call us at 251-964-1300 today to schedule your test drive. Tax, Title, Tags and dealer fee of $299.50 are not included in vehicle prices shown and must be paid by the purchaser. While great effort is made to ensure the accuracy of the information on this site, errors do occur so please verify information with a representative. This can be done by calling the dealership at 251-964-1300 or by visiting. Credit approval is subject to approval from one of our many lending sources. Lending Institution fee's charged to the dealer and interest are not included in vehicle prices and must be paid by the purchaser.